With my first navigation rally looming, I woke up on Saturday morning feeling pretty rough with an ear infection. Hmmm, not great. Oh well, I got on with things, prepping the bike, checking everything as I normally do. I popped over to ET James to get some bits and bobs later in the morning and then fitted a new chain link clip. I'd had a problem with the bike the last time I rode it, the likely cause being some dirt in the carburettor, so I test rode it pretty hard for 10 minutes just to make sure all was well. 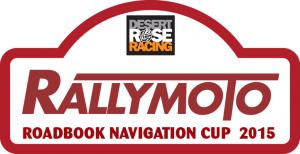 This preparation was for the first round of a new UK series, the 2015 RallyMoto Cup, which was the Pikes Peak Navigation Rally - a 140Km roadbook only route. Anyway, one of the things I really wanted to check during my "shakedown" was the ICO speed mode. We found out in the final instructions that the speeding penalty system meant some hefty time penalties, so it was really important for me to be able to switch my ICO to speed mode and avoid any penalties. Unfortunately, I discovered that my remote switch wasn't working properly - only the up/down buttons worked, so I couldn't use the 3rd button to switch modes! It's still possible to switch by clicking both buttons at the same time, but it's very tricky to do with one hand. I tested it this way and I kept adjusting the trip accidentally, so I found I had to use my left thumb on one button and then bring my right hand over to operate the other one at the same time! Finding this out the day before the race didn't fill me with confidence. Some of the speed controls would be done on guesswork. Then there was the hefty time penalty I knew I would get for refuelling - 5 minutes! I knew there was no way I could make up that amount of time on anyone on one tight check, so I was already dreading a poor result. So my goal for the race changed and became to show that I could compete with the front runners when it came to navigating well and quickly. Ultimately that became trying to set a good time on the tight check, so that I could take something positive away with me to the next round. I finished preparing my bike and when I was happy with it, loaded it into the trailer, only when I did that, I noticed that the seat was loose! I looked underneath and sure enough, I'd lost the seat bolt. Obviously (sod's law applied here) I didn't have the right size bolt, so I had to fashion something and hope it would hold. None of this helped by the fact that the thread has stripped inside the seat. With all that sorted, I went off to sign on and to the briefing at The Hafod Hotel in Pontarfynach (Devil's Bridge). I signed on and collected my tracker - it turned out to have a fair bit of cable attached, I wasn't sure how I was going to fit it, but I managed to squeeze it onto the roadbook mounting plate and coil up the wire next to it. We also collected our roadbooks while we were there, and I took the opportunity to mark it up in the company of all the other riders - at that point I really felt the rally spirit! Just like all the photos you see from international rallies across the globe, there we were, a room full of keen riders, with giant rolls of colourfully marked paper splaying across the room. A great atmoshpere. Then we had the riders briefing, with Burt and Moly outlining some important parts of the roadbook and some tips - mostly the dangers. Once we were done with the briefing and roadbook marking, I went home and fitted my tracker. At that point I got a message from Burt to say "we can see you on the tracking system"! Great stuff. Then I loaded my roadbook into the roadbook holder and we were good to go. I also left a note for myself to switch off the clock mode on the ICO before the start of the race, once I had switched all the navigation equipment on (long story). I got some much deserved sleep, then got up at 6am on Sunday morning. I jumped in the car and off we went to Pontarfynach. On arrival, the weather was awful - it was foggy, raining cats and dogs and it was pretty cold too! I had my wet weather gear ready, but I wasn't particularly looking forward to a days' riding in those grim conditions I have to say. I caught up with some familiar faces in the paddock and eventually got kitted up. I switched the navigation equipment on, disabled the clock on the ICO and warmed the bike up, then memorised the first few instructions on the roadbook, just in case. I watched the clock "count down" to 10:05, then off I went towards CP1 (Check Point 1). There were two things I was telling myself in my head all day while I was riding, and those were "check the next 3 instructions" and "watch out for the speed control zones"! I had a blast on the first CP, having lots of fun navigating and overtaking a couple of riders in front of me. It was very cold and wet though - by the time I got to CP1, I was very cold indeed. When I got there, Lee "Stretch" Green was already there and had been for some time. It was a pretty long wait until we could get going again, by which point I was really shivering! Some of us had more luck than others on the first CP, particularly with the weather conditions! 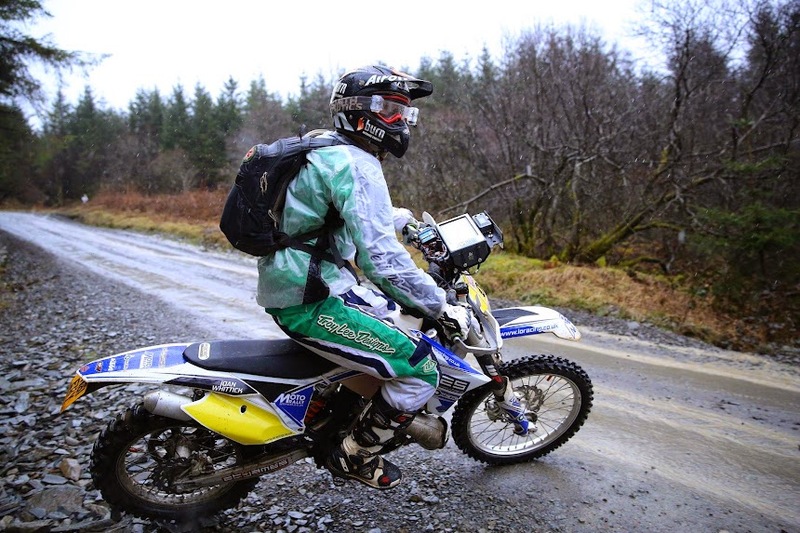 Poor Rob Loupart's roadbook holder couldn't stand all the rain and let some of it in, soaking his paper roadbook. It tore fairly early on and that was the end of that - he was riding blind for the rest of the day. Fair play, he did very well given he had no idea where to go! I'd lost my concentration in the time we'd been at the check, and when we left, we turned out of the village and passed a national speed limit sign. I accelerated a little, then I looked down at my roadbook and realised the speed control zone extended past the sign! I was so annoyed with myself for that, I knew I'd got a speed control penalty for it, but I wouldn't know how much until the end. Apart from that small incident, I navigated really well throughout the race, enjoying it immensely. I kept a good pace and caught some riders on each CP (not that we were racing, but it felt good to be on the pace). Somewhere between CP3 and CP4, I found myself leading the way. 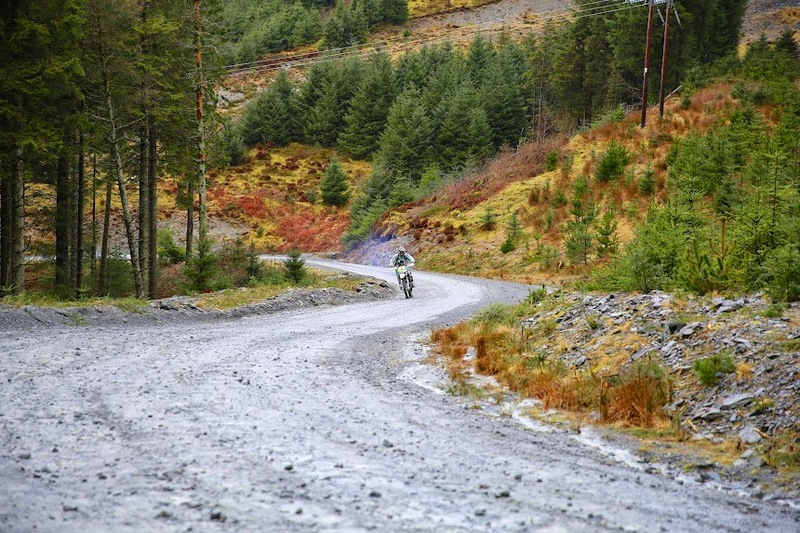 On one of the fire road sections, my bike started to run out of fuel, so I switched it onto reserve while I was on the move, that was really worrying! I knew we were a long way from the CP4 refuelling point and I only had my reserve to get me there! I started to ride really conservatively to save fuel and it became a game of fuel economy! I kept watching the level on the tank as I got closer to CP4. I tried to scroll forward on the roadbook at times to see where the CP was, but I couldn't find it! I was genuinely worried I'd run out of fuel out on the check. Luckily, I just about managed to get back to the refuel point - there was probably no more than a cup-full of fuel left in the tank when I arrived, I was pretty lucky there. The thing was, with a 5 minute penalty for refuelling, there was no way I was going to do it twice, so I gambled on the distance to get to the second refuel which was around 90km in. Anyway, I got away with it, just about, and brimmed the bike ready for the tight check coming up. I swapped goggles and gloves, then set off to CP5. "Here we go" I thought, this is where everything matters - going fast and navigating well when it counts! I had a really good check and enjoyed myself, absolutely loving it! I rode at about 90% and although I took no risks I was pushing fairly hard. Once we got to the end of the CP, there was a small loop to get back to the finish. I thoroughly enjoyed it, what a great day's racing! Navigation wise, I overshot a couple of turnings, but otherwise only got lost once and managed to correct it quickly. I learnt some really good things for the next race which should hopefully put me in a good position to compete for a good result. As for the results from Pikes Peak, I picked up at least 9 minutes in penalties, so let's wait and see how everyone else did. Thanks to everyone from the RallyMoto club for putting the event on - the first of its kind and a real triumph for the UK rally scene, well done! My friends have been professionally engaged in motocross for a long time. Now they are actively developing their team, as they have serious plans for the future. Most recently, I found this uboro.io and showed it to my friend, he decided to test this software. The result was extremely positive, especially since the software is free for a while.